Bainite is an acicular microstructure (not a phase) that forms in steels at temperatures from approximately 250-550°C (depending on alloy content). First described by E. S. Davenport and Edgar Bain, it is one of the decomposition products that may form when austenite (the face centered cubic crystal structure of iron) is cooled past a critical temperature of 727 °C (about 1340 °F). Davenport and Bain originally described the microstructure as being similar in appearance to tempered martensite. A fine non-lamellar structure, bainite commonly consists of cementite and dislocation-rich ferrite. The high concentration of dislocations in the ferrite present in bainite makes this ferrite harder than it normally would be.The temperature range for transformation to bainite (250-550°C) is between those for pearlite and martensite. 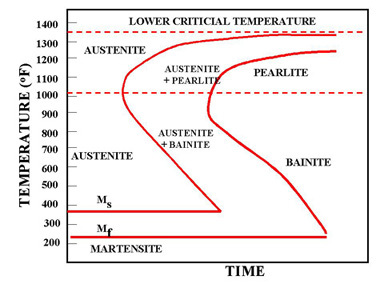 When formed during continuous cooling, the cooling rate to form bainite is more rapid than that required to form pearlite, but less rapid than is required to form martensite (in steels of the same composition). Most alloying elements will lower the temperature required for the maximum rate of formation of bainite, though carbon is the most effective in doing so. 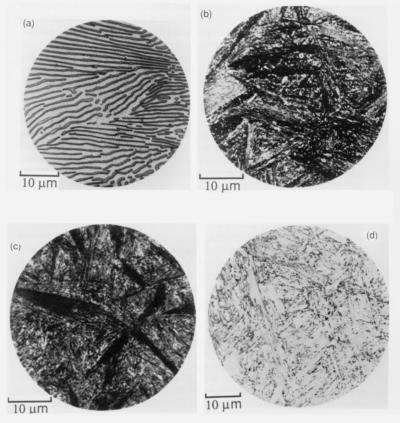 The microstructures of martensite and bainite at first seem quite similar; this is a consequence of the two microstructures sharing many aspects of their transformation mechanisms. However, morphological differences do exist that require a TEM to see. 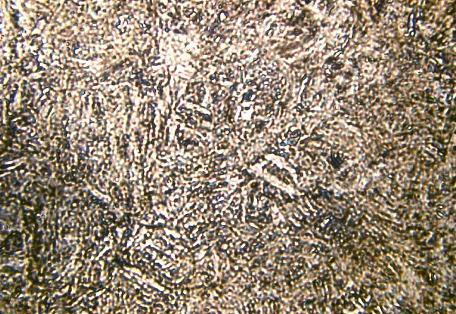 Under a simple light microscope, the microstructure of bainite appears darker than martensite due to its low reflectivity.Bainite is an intermediate of pearlite and martensite in terms of hardness. For this reason, the bainitic microstructure becomes useful in that no additional heat treatments are required after initial cooling to achieve a hardness value between that of pearlitic and martensitic steels. 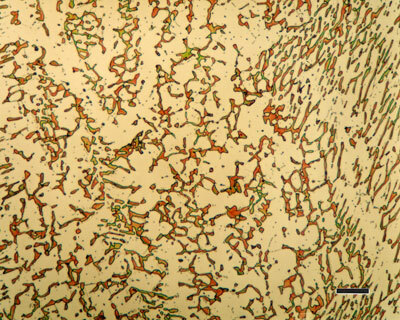 Microstructures in a eutectoid steel. (a) Pearlite formed at 720 oC, (b) bainite formed at 290 oC, (c) bainite formed at 180 oC, and (d) martensite. Source : Functions of the alloying elements in steel, Bain, E. C., American Society for Metals, Metals Park, Ohio, USA, 1939. 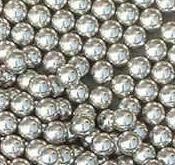 In the 1920s Davenport and Bain discovered a new steel microstructure which they provisionally called martensite-troostite, due to it being intermediate between the already known low-temperature martensite phase and what was then known as troostite (now fine-pearlite). This phase was subsequently named bainite by Bain’s colleagues at the United States Steel Corporation although it took some time for the name to be taken up by the scientific community with books as late as 1947 failing to mention bainite by name. 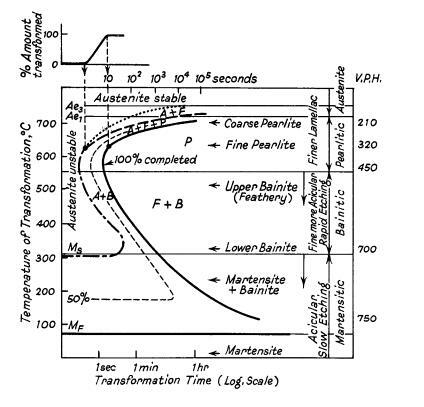 Bain and Davenport also noted the existence of two distinct forms: ‘upper-range’ bainite which formed at higher temperatures and ‘lower-range’ bainite which formed near the martensite start temperature (these forms are now known as upper- and lower-bainite respectively). The early terminology was further confused by the overlap, in some alloys, of the lower-range of the pearlite reaction and the upper-range of the bainite with the additional possibility of proeutectoid ferrite. 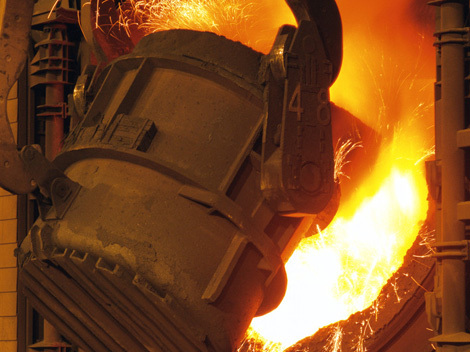 At 900 °C a typical low-carbon steel is composed entirely of austenite, the high temperature phase of iron. Below around 700 °C (723 °C in pure iron) the austenite is thermodynamically unstable and, under equilibrium conditions, it will undergo a eutectoid reaction and form pearlite - an interleaved mixture of ferrite and cementite (Fe3C). In addition to the thermodynamic considerations indicated by the phase diagram, the phase transformations in steel are heavily influenced by the kinetics. This leads to the complexity of steel microstructures which are a strongly influenced by the cooling rate. This can be illustrated by a continuous cooling transformation (CCT) diagram which plots the time required to form a phase when a sample is cooled at a specific rate thus showing regions in time-temperature space from which the expected phase fractions can be deduced for a given thermal cycle. Between about 500° and 350°C initial nuclei are ferrite which is coherent with the austenite matrix. Cementite then precipitates from the carbon-enriched layer of austenite, allowing further growth of the ferrite.The carbides tend to lie parallel to the long axis of the bainite needle to form the typical open feathery structure of upper bainite. Below 350°C coherent ferrite, supersaturated with carbon, forms first and is then followed by the precipitation of carbide within the ferrite needle, transversely at an angle of 55°. A proportion of the carbide is Fe2,4C and the ferrite contains a little dissolved carbon. This lower bainite structure is somewhat similar to lightly tempered martensite. Bainite occupies a region between these two process in a temperature range where iron self-diffusion is limited but there is insufficient driving force to form martensite. In contrast to pearlite, where the ferrite and cementite grow cooperatively, bainite forms by the transformation of carbon-supersaturated ferrite with the subsequent diffusion of carbon and the precipitation of carbides. A further distinction is often made between so-called lower-bainite, which forms at temperatures closer to the martensite start temperature, and upper-bainite which forms at higher temperatures. This distinction arises from the diffusion rates of carbon at the temperature at which the bainite is forming. 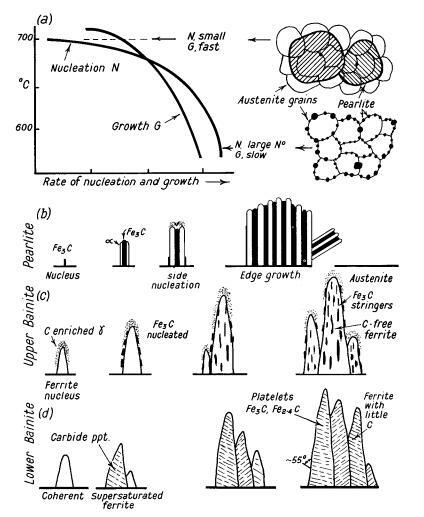 If the temperature is high then the carbon will diffuse rapidly away from the newly formed ferrite and form carbides in the carbon-enriched residual austenite between the ferritic plates leaving them carbide-free. So-called “upper bainite” forms around 400-550°C in sheaves. These sheaves contain several laths of ferrite that are approximately parallel to each other and which exhibit a Kurdjumov-Sachs relationship with the surrounding austenite, though this relationship degrades as the transformation temperature is lowered. The ferrite in these sheaves has a carbon concentration below 0.03%, resulting in carbon-rich austenite around the laths.The amount of ferrite that forms between the laths is based on the carbon content of the steel. For a low carbon steel, typically discontinuous “stringers” or small particles of cementite will be present between laths. For a higher carbon steel, the stringers become continuous along the length of the adjacent laths. eLower bainite forms between 250-400°C and takes a more acicular form than upper bainite. There are not nearly as many low angle boundaries between laths in lower bainite. In lower bainite, the habit plane in ferrite will also shift from <111> towards <110> as transformation temperature decreases. In lower bainite, cementite nucleates on the interface between ferrite and austenite.